With a remote location in the northern part of Hwange, Nehimba is an oasis in the wilderness and your stay will be one of discovery combined with elegance and African charm. The main area is built on stilts maximising on the views of the surrounding landscape. The large open plan lounge shares the upper deck with the dining area and bar, the dining area also spreads onto a lower deck. Here you will find the swimming pool, both the deck and the pool have excellent views of the waterhole. There are nine thatch-covered tents, each built on its own teak platform. All tents overlook a magnificent waterhole, often frequented by elephants and they are a wonderful haven, the perfect place to spend a few hours escaping the heat of the day. The decor has distinct hints of Africa, warm colours have been used to blend together with the wooden structure. Each has a king-size bed, safe, minibar, tea/coffee facilities with expresso machine, ceiling fan and mozzie nets. The timber-clad bathroom has an outdoor shower, a ball and claw bathtub and thick bathrobes. Two of the suites are family units with twin beds located in an alcove. No two days are the same at Nehimba with plenty to keep you busy. Game drives are offered both during the day and after dark, the beauty of being in a private concession! It is also possible to take part in a walking safari here, it's a thoroughly enjoyable way to get up close and personal with the smaller beings of the park, the myriad of small mammals and insects that you might otherwise miss, and all this can be done while tracking the largest inhabitants, the elephants. Nehimba also has a hide, and it really is worth spending some time here, you will get some good photographs of wildlife and scenery. It's also possible to take excursions to Mandavu Dam and the Mtoa ruins from Nehimba, and there is of course Nehimba Seep, the camp gets its name from this permanent water source. Finish off each day with sundowners, an excellent dinner, and stories around the campfire before turning in! Open: Nehimba Lodge is open all year. Location: Hwange National Park, in a private concession. Rooms: There are 9 luxurious tents in total, all en-suite and set on elevated decks with thatched roof. There are 2 family units which have an alcove housing twin beds, complete with mozzie nets, 5 doubles and 2 twin bedded tents. Dining: Meals are a mixture of communal dining and individual tables. Children: The camp does not take children under 7. 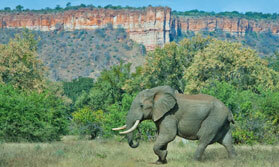 Also there are age restrictions for walking safaris, but nature walks around camp are on offer. Communication: There is WiFi in the main area of the lodge.